As part of our celebrations for Teresa's fifth centenary, the Carmelite Forum of Britain and Ireland have commissioned the recording of a new audio CD, and a special calendar. A Carmelite Blessing features music specially composed for the centenary year, as well as readings from Teresa's writings. Part I is a souvenir of the Opening Ceremony at Kensington Priory on 15th October 2014. The section includes all the music, scripture readings and intercessions of the Opening Mass, including the three newly commissioned pieces: Praying with Teresa, Homage to Teresa and The Carmelite Blessing. Part II includes training tracks for communities wishing to learn the sung responses to Praying with Teresa and Homage to Teresa. Part III is a series of readings from St Teresa's writings. These provide a useful resource for groups planning prayer evenings and retreat days. The extracts can be interspersed with time for quiet reflection and musical pieces from Part I of the CD. 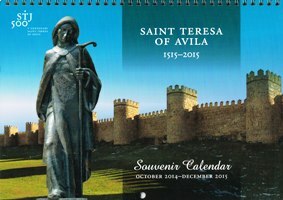 A beautiful calendar has been produced for the Teresa 500 Year. This 15 month calendar runs from October 2014 to December 2015. Full colour A4 spiral bound, beautifully designed paintings, icons and images of Teresa, quotations from her writings, important historical dates and events in her life. A treasured souvenir and a perfect gift. ﻿The CD and calendar are now available and can be ordered from the Carmelite Book Service in Oxford and Saint Albert's Press in Faversham. They will also be available for sale at the major events during the Teresa Year. Alternatively, order you copies of the CD from Ware Carmel by email. CDs ordered by post cost £8.50 (including P&P in the UK).